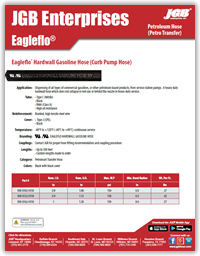 Eagleflo® Hardwall Gasoline / Curb Pump Hose - JGB Private Brand - Hose by Vendor - JGB Enterprises, Inc.
A Curb Pump Hose / Diesel Hose - Station Hose dispensing all types of commercial gasolines or other petroleum based products, from service station pumps. A heavy-duty hard wall hose which does not collapse in reel use or behind the nozzle in heavy duty service. Braided, high tensile steel wire. -40°F to +120°F (-40°C to +49°C) continuous service. Contact JGB for proper hose fitting requirements. Custom lengths made to order.